An integrated circuit is a single, miniature circuit with many electronically connected components etched onto a small piece of silicon or some other semiconductive material. (A semiconductor is a nonmetallic material that can conduct an electric current, but does so rather poorly.) Integrated circuits are more commonly known as microchips. The components etched onto an microchip include transistors, capacitors, and resistors. A transistor is a device capable of amplifying and switching electrical signals. A capacitor temporarily stores electrical charges, while a resistor controls current by providing resistance. The complete closed path through which an electric current travels is called a circuit. The invention of the transistor in 1948 eliminated the need for bulky vacuum tubes in computers, televisions, and other electronic devices. As other components were also reduced in size, engineers were able to design smaller and increasingly complex electronic circuits. However, the transistors and other parts of the circuit were made separately and then had to be wired together—a difficult task that became even more difficult as circuit components became tinier and more numerous. Circuit failures often occurred when the wire connections broke. The idea of manufacturing an electronic circuit with multiple transistors as a single, solid unit arose as a way to solve this problem. Capacitor: Device in an electric circuit that temporarily stores electrical charge. Circuit: The complete closed path through which an electric current travels. Electric circuit: The closed path through which an electric current (flow of electrons) travels. Microchip: Another name for an integrated circuit. Resistor: Device in an electric circuit that controls current by providing resistance. 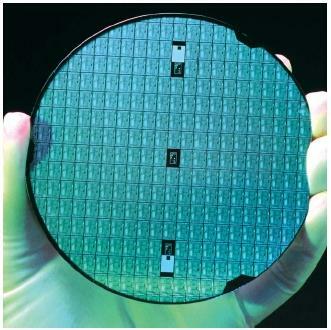 Semiconductor: Substance, such as silicon or germanium, that can conduct an electric current, but does so rather poorly. Transistor: Semiconductor device capable of amplifying and switching electrical signals. In the late 1950s, two engineers—Jack Kilby (1923– ) of Texas Instruments and Robert Noyce (1927–1990) of Fairchild Semiconductor—began wrestling with the circuit problem. Independently, the two men developed similar devices. Kilby's circuit, however, was made of germanium and was less efficient and hard to produce. Noyce's was constructed of silicon. Transistors were etched onto the silicon chips, thus eliminating the need for costly wire connections. The reduction in size of the circuit components brought about an increase in the speed of their operation. 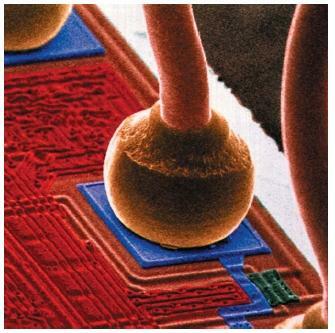 At first, only a few transistors could be etched on a microchip. By 1964, the number grew to 10. Ten years later, the number had reached 32,000. Today, a chip can carry more than 1,000,000.
continues to the present, as integrated circuits can be found in almost all electronic devices. why did called integrated circuit is chip? what are the parts of integrated circuit? can u give answer for my assignment..